Fastmount, New Zealand designer and manufacturer of panel mounting systems, has launched its first ever clip that allows decorative interior panels to be directly mounted onto concrete walls in commercial and residential interiors. Installation methods of attaching panels to concrete walls typically involve creating a framework to mount panels onto, to achieve a level mounting surface. The new PC-DC1 has been designed to allow installers to bypass these steps, to save time on new-build and refit jobs. The PC-DC1 pairs with Fastmount’s PC-F1A clip from the Standard Range, and is hammer-set into a 26mm hole in concrete or brick walls. It allows up to 6mm of transverse adjustment to help to level uneven walls quickly, whilst ensuring the perfect panel finish that Fastmount is known for. Additionally, the PC-DC1 can self-tap into plasterboard or drywall, giving installers the option to use the full breadth of the Standard Range – which offers pull out loads of 2kg – 15kg, depending on the male clip chosen and to suit the weight of the panels. “We developed the PC-DC1 after consulting our northern hemisphere customers, where a large majority of buildings are constructed out of concrete blocks or stone. Attaching decorative or acoustic panels directly to these types of walls with no visible fixings has always been a time consuming job for interior installers due to the framework required to attach panels to the walls. “What we have developed is a step further – not only does the new DC1 remove the need for timber battens to be attached, but we have also included the ability to adjust the clip depth off the wall, meaning the installer can quickly level a wall that is not completely even,” comments Gregg Kelly, Managing Director and Head of Innovation at Fastmount. Having found its initial success in the demanding superyacht industry, Fastmount is steadily increasing growth in the architectural industries in Europe and the United States, collaborating with architects, builders and distributors to solve panel mounting problems on land. 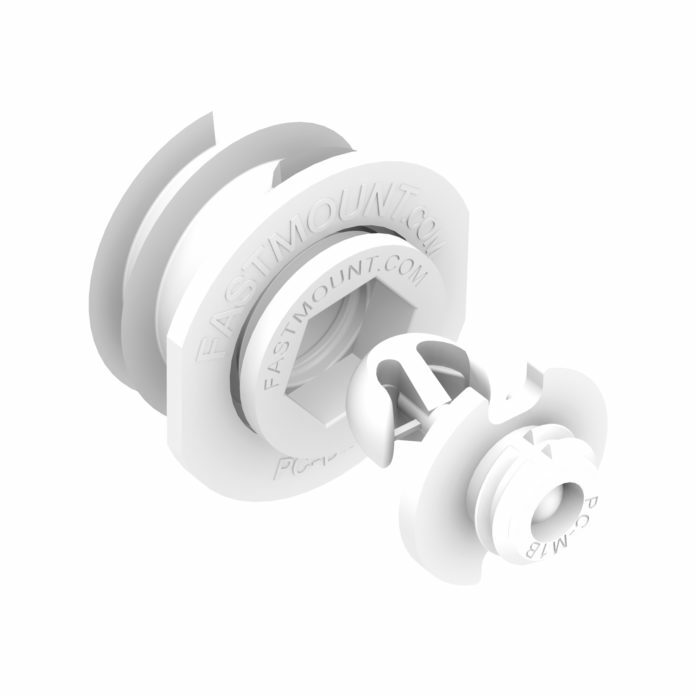 The PC-DC1 is available now from authorized Fastmount distributors worldwide.